On Photo Assignment: The Management Of Montana's Wilds : The Picture Show From the field: NPR photographer John Poole shares some of his favorite shots from a recent trip to Montana. In June, NPR science correspondent Chris Joyce and I visited southwest Montana for a series about what it takes to "manage" wilderness, as strange as that sounds. We chronicled the predicament of the greater sage grouse and the Arctic grayling — and a report published Sunday looks at efforts to maintain the area's "natural" state by setting controlled fires. But there were plenty of photos that didn't fit into those stories. Here are two of my favorites. The first is an image of a juvenile red-tailed hawk. I liked it immediately when I looked through the day's take. It's different. Raptors are grand, dangerous, formidable birds. But this one looks like it woke up on the wrong side of the bed with a cowlick. 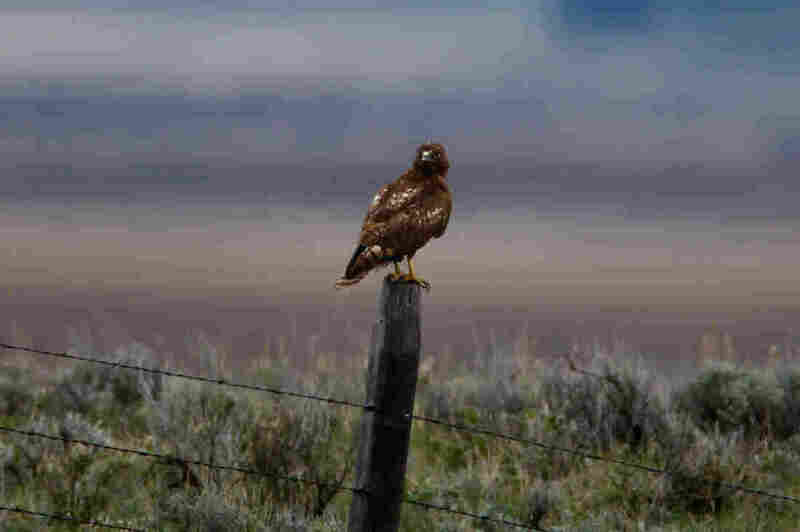 Even a hawk — the most powerful bird on the steppe — can have an off day, it seems. Maybe there's hope of the rest of us. You have to get up early to see a sage grouse "lek" (or a gathering of male grouse) — around 4:30 a.m., it turns out. The males strut around like cartoon birds, expanding and rapidly deflating the large yellow air sacks on their chests. The ladies, apparently, like to watch. And so, apparently, do coyotes. 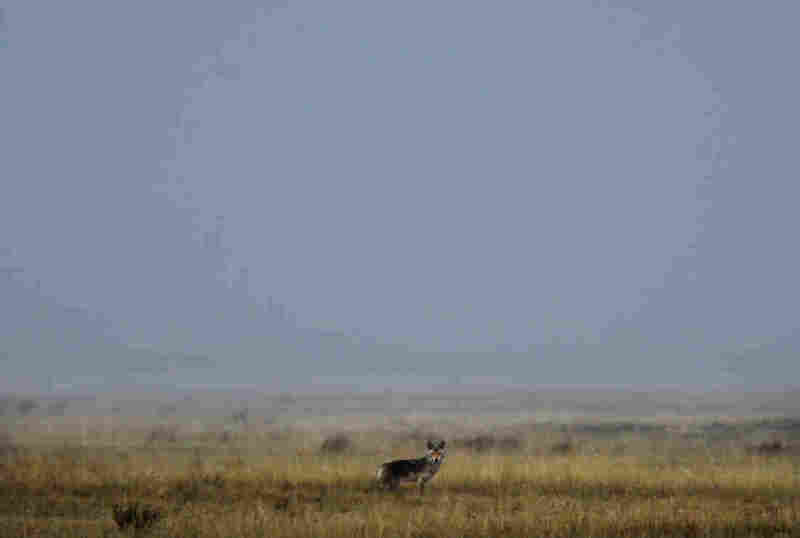 This one appeared out of the morning mist as a speck in the distance. Only with the magnification of an 840mm lens could I see him. 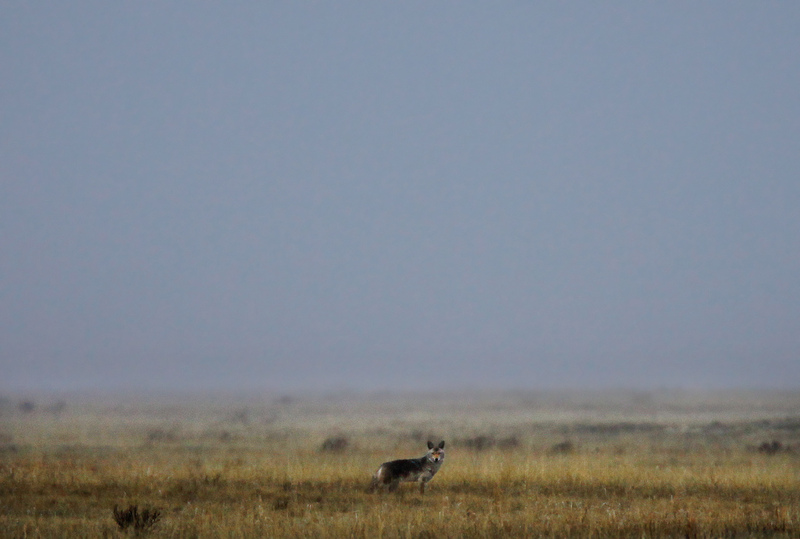 He was trying to sneak up on the sage grouse — which were (sadly) spooked by me and my giant lens. I immediately realized I'd probably ruined his hopes for breakfast. The least I can do is thank him publicly.